Do you have photos, historical accounts or other items pertaining to the Thomson area? Would you like to share this historical information with the world? LakesnWoods.com would like to publish your Thomson photos (current or historical) or historical accounts on this website. Original materials can be returned and your privacy will be respected. 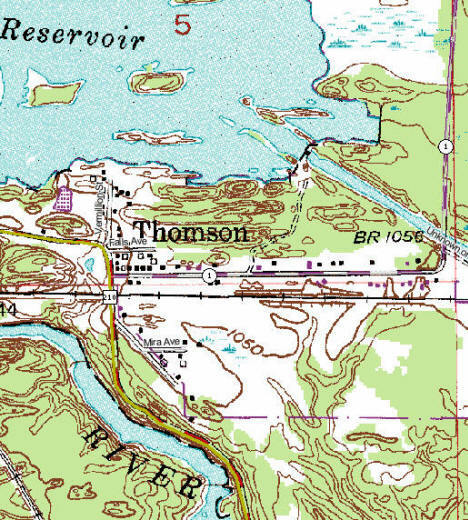 Thomson was a city in Carlton County, Minnesota, along the St. Louis River. On November 5, 2013, a vote to authorize the consolidation of Thomson and nearby Carlton passed with a 95% approval. 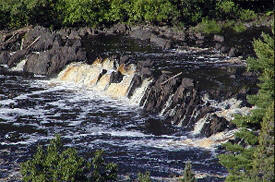 Thomson is adjacent to Jay Cooke State Park and is located on the Willard Munger State Trail. 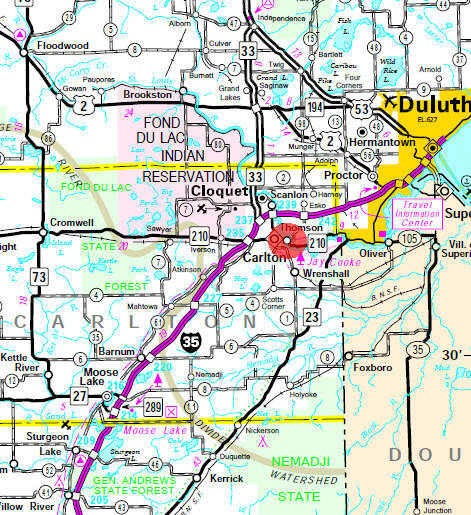 Minnesota Highway 210 serves as a main arterial route in the community. As of the census of 2010, there were 159 people, 73 households, and 48 families residing in the city. The population density was 85.0 inhabitants per square mile (32.8/km2). There were 76 housing units at an average density of 40.6 per square mile (15.7/km2). The racial makeup of the city was 96.9% White, 1.3% Native American, 0.6% Asian, 0.6% from other races, and 0.6% from two or more races. There were 73 households of which 21.9% had children under the age of 18 living with them, 60.3% were married couples living together, 1.4% had a female householder with no husband present, 4.1% had a male householder with no wife present, and 34.2% were non-families. 28.8% of all households were made up of individuals and 8.2% had someone living alone who was 65 years of age or older. The average household size was 2.18 and the average family size was 2.69. The median age in the city was 48.2 years. 17% of residents were under the age of 18; 4.4% were between the ages of 18 and 24; 23.9% were from 25 to 44; 35.9% were from 45 to 64; and 18.9% were 65 years of age or older. The gender makeup of the city was 48.4% male and 51.6% female. THOMSON Township received its name from the station and village of the St. Paul and Duluth and Northern Pacific Railroads, built in 1870. This village was the county seat from that date until 1886 and was incorporated as a village in 1891; it had a post office, 1870-1955. The name was given by officers of the former line in honor of David Thompson, the Canadian explorer and geographer, but it has been generally spelled as if for James Thomson (1700-1748), the Scottish poet, author of "The Seasons." Articles in the St. Paul newspapers of 1869 and 1870, however, spelled the name Thompson and stated it was named for J. Edgar Thompson, president of the Pennsylvania Central Railroad. passed with a 95% approval. See Carlton for government information. 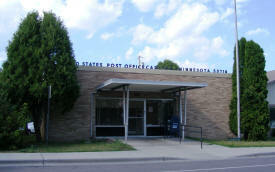 Post Office: Thomson had a Post Office from 1870 until 1955 and is today served by the Carlton Post Office. Park trails link up to the Willard Munger State Trail at the north edge of the park; perfect for backpackers, bikers (both mountain and tour), hikers, horseback riders, and skiers. Check out the wildflowers in the spring, and the vivid colors in the fall. 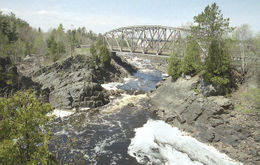 Walk on the swinging suspension bridge high above the raging St. Louis River. Visit the historic cemetery and the gorge at Thomson Dam.